Not to be confused with patriarchy. Patriarchate (Greek: πατριαρχεῖον, patriarcheîon) is an ecclesiological term in Christianity, designating the office and jurisdiction of an ecclesiastical patriarch. Three patriarchates were established by the apostles as apostolic sees in the 1st century: Rome, Antioch, and Alexandria. Added to these were Constantinople in the 4th century, and Jerusalem in the 5th century. Eventually, together, these five were recognised as the pentarchy by the Council of Ephesus in 431. In the rest of the history of Christianity, a few other patriarchates were gradually recognised by any of these above ancient episcopal sees. With time, eventually some of them fell due to military occupations following the Islamic conquests of the Middle East and North Africa, and became titular or honorary patriarchates with no actual institutional jurisdiction on the original site. Five ancient patriarchates of the Pentarchy, headed by patriarchs as the highest-ranking bishops in the Christian Church prior to the Great Schism, were the patriarchates of Rome, Constantinople, Alexandria, Antioch, and Jerusalem. The East-West Schism of 1054 split the Latin-rite see of Rome from the four Byzantine-rite patriarchates of the East, thus forming distinct Roman Catholic and Eastern Orthodox Churches. The four Eastern Orthodox patriarchates (Constantinople, Alexandria, Antioch and Jerusalem), along with their Latin Catholic counterpart in the West, Rome, are distinguished as "senior" (Greek: πρεσβυγενή, presbygenē, "senior-born") or "ancient" (παλαίφατα, palèphata, "of ancient fame") and are among the apostolic sees, having had one of the Apostles or Evangelists as their first bishop: Andrew, Mark, Peter, James, and Peter again, respectively. There are ten current patriarchates within the Catholic Church: six are patriarchates of Eastern Catholic Churches, followed by Latin Patriarchate of Jerusalem), and three junior Latin patriarchates of Lisbon, Venice and the East Indies. Some of the Eastern Catholic patriarchates are active on the same territories. Damascus is the seat of the Syriac Catholic and the Melkite Catholic Patriarchates of Antioch, while the Maronite Catholic Patriarchate of Antioch has see in Bkerké, Lebanon. In the Roman Catholic Church, some patriarchal titles are purely honorary, without an actual residential see, and hence termed Titular Patriarchates, either vested in another (residential) patriarchal see or in the Pope's gift. Nine of the current autocephalous Eastern Orthodox Churches, including the four ancient churches of Constantinople, Alexandria, Antioch and Jerusalem mentioned above, are organized as patriarchates. In chronological order of establishment, the other five are: Georgian Patriarchate, Bulgarian Patriarchate, Serbian Patriarchate, Russian Patriarchate and Romanian Patriarchate. The Eastern Orthodox Patriarchate of Antioch moved its headquarters to Damascus in the 13th century, during the reign of the Egyptian Mamelukes, conquerors of Syria. Christian community had flourished in Damascus since apostolic times (Acts 9). However, the patriarchate is still called the Patriarchate of Antioch. A patriarchate has "legal personality" in some legal jurisdictions, that means it is treated as a corporation. For example, the Eastern Orthodox Patriarchate of Jerusalem filed a lawsuit in New York, decided in 1999, against Christie's Auction House, disputing the ownership of the Archimedes Palimpsest. 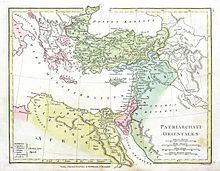 There are several patriarchates within the Oriental Orthodoxy. There are also among the branches of the Church of the East. The head of the Czechoslovak Hussite Church is also called a Patriarch. ^ Annuario Pontificio 2012, pp. 3-8. The title of "Patriarch of the West" for the Pope is no longer in use. ^ In his motu proprio [http://www.vatican.va/holy_father/paul_vi/motu_proprio/documents/hf_p-vi_motu-proprio_19650211_ad-purpuratorum_lt.html Ad Purpuratorum Patrum of 11 February 1965, Pope Paul VI decreed that Eastern Catholic Patriarchs who became cardinals would be ranked as Cardinal Bishops, not Cardinal Priests, as had previously been the case, and that they would yield precedence only to the six Cardinal Bishops who hold the titles of the suburbicarian sees. Herbermann, Charles, ed. (1913). "Patriarch and Patriarchate". Catholic Encyclopedia. New York: Robert Appleton Company.